This Halwa is a melt in your mouth, sneak another bowl full type of halwa. My aunt made this last month and I hounded her for the recipe, and as she was telling me how she made it I couldn’t believe the amount of butter she was telling me to write down, and you might not either, but TRUST ME. You need it, and it’s delicious. Serve this on it’s own with a delicious cup of chai, or have a desi feast at breakfast with halwa, puri and chaney. You can even wake up at 3 am and eat some straight out of the fridge. It’s all ok. But I feel like I have to warn you. 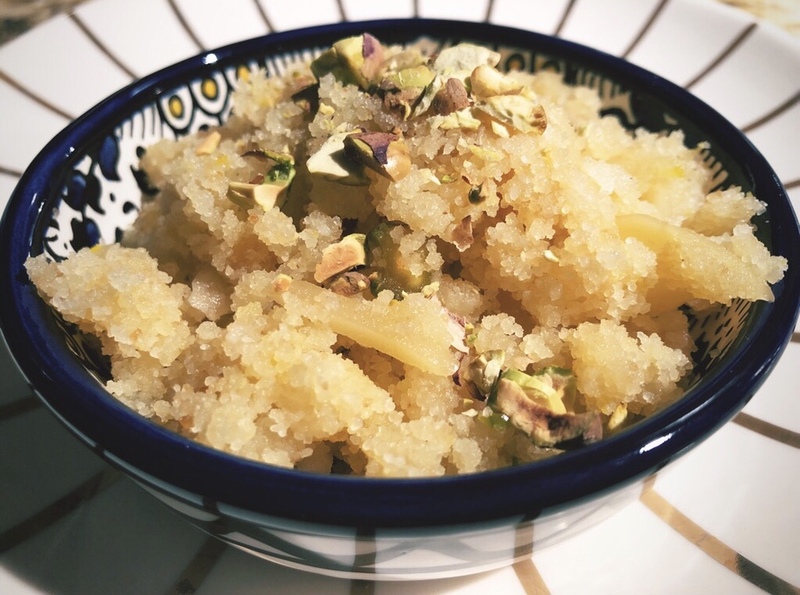 This halwa isn’t for the faint of heart. Not only is it utterly decadent, but it also takes quite a long time to make, approximately an hour, to tell you the truth. But it’s worth it. TRUST. Start off by soaking the suji in the milk for about 10-15 minutes. While it’s soaking, melt the butter in a large deep pan, adding the oil and alaichi. After a few minutes add the suji and milk and continuously stir. It’ll start out as a gooey mess and as you keep stirring, the suji will magically absorb all that butter and oil and start expanding like anything. Keeping the flame on medium low, keep stirring, until the suji becomes slightly clumpy. Once it’s reached that stage stir occasionally to make sure it doesn’t stick to the bottom. You don’t have to watch it like a hawk, but keep an eye on it and stir until the mixture becomes crumbly and changes to a brownish red. It will take you anywhere from 45-55 minutes. But again. Let me remind you. It’s worth it! While all of this stirring and waiting is taking place, in a small saucepan heat the sugar and water until a syrup forms. I used 1 full cup of sugar but found it a little too sweet for my liking, hence the suggestion of 3/4-1 cup, depending on how you like your halwa. I would definitely prefer 3/4 cup. Once the halwa has changed color, carefully add the sugar syrup. Make sure it has cooled down a bit before you add it or it’ll splatter everywhere, and burning syrup splashing everywhere isn’t fun. It’s pretty painful actually. Just like when the suji absorbed the butter, it will absorb this syrup before you know it, so keep on stirring for a few minutes till it does. Then add the beaten egg and mix again like your life depends on it, because halwa and scrambled eggs don’t go well together. Once the egg has also been absorbed just let it cook for a few minutes and add the chopped nuts. Serve warm. This keeps in the fridge for about a week in an airtight container. Just heat it up before serving and it’ll taste just as good as the day you made it.